295 pages of mystical magical fun, it’s not surprising that the first instalment of the Magisterium series, which Cassandra and Holly have informed us will consist of 5 books, is currently at number 3 in the New York Times best-seller list. Quite surprising after the mixed reviews it has seen since being published on September 7th. The creators of this incredible world are Cassandra Clare and Holly Black. Cassandra Clare is the author of the best-selling series The Mortal Instruments, The Infernal Devices Trilogy and The Bane Chronicles. Her books have sold over 30 million copies in print worldwide. Holly Black is the best-selling author of contemporary fantasy novels for young people, including Tithe: A Modern Faerie Tale, Doll bones and the Spiderwick series. Now the Magisterium awaits him. It’s a place that’s both sensational and sinister, with dark ties to his past and a twisty path to his future . The Iron Trial is just the beginning , for the biggest test is still to come . . .
Callum Hunt (Call) is a twelve-year-old boy brought up to believe that magicians are the most dangerous and evil things that exist in the world and magic will kill you. His mother was killed by mages and his father says it’s all down to magic and specifically the Magisterium. 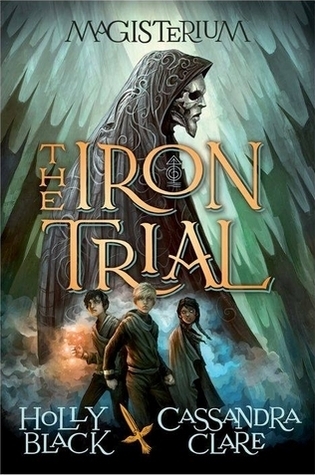 Callum’s father teaches him to fail all the entrance exams required to join the Magisterium. However Call fails so badly it draws the attention of Master Rufus and he is picked to be his apprentice; which means leaving his father and heading for the one place Call doesn’t want to go. The Magisterium. Despite Calls anger at having to go to the Magisterium he soon realises it’s not as bad as his father made it out to be. He makes new friends and he feels like he fits in better than he did in regular school. Having always had problems with his leg since he was baby, unable to do the things all the other children do, by learning how his magic works he feels freer to do the things that normally held him back. However it’s not long before Call realises there is something different about him, with his dad always telling him “you don’t know what you are” it leads to great suspicions when Call finds out the mages are searching for the next Makar. The only person who can destroy the enemy of death. The only person who can bring an end to the endless war. The mages last hope. A heavy weight to put on a twelve-year-old boy, but it turns out that Call isn’t mages last hope in truth he’s far from it. With the same idea of two boys and one girl headed for a magical school. Kids who hate each other at the start, but grow to realise they have much in common, many could say Magisterium is a rip-off Harry Potter. For instance, the main villain (the enemy of death) consumed by darkness as he is obsessed with immortality, sounds a little bit like Voldemort if you asked me. As well as this the main character afflicted by the enemy; part of his soul trapped inside- or well in this case all of his soul, way too similar to a certain series we know. And then the magical food, really? Wasn’t there any other way? However despite the obvious similarities to Harry Potter, it is not a rip-off HP . Anyone can write about magic and a magical school and many have, a prime example of this is ‘Heir of Fire’ by Sarah J. Maas. Just because J. K. Rowling has been the most successful doesn’t mean that every other book written about magic is a copy. I love Harry Potter as much as the next potterhead having grown up with the story, but do we really have to compare every magic book to it? Magisterium doesn’t use magic as metaphor to talk about heroism, bravery, good and evil. In fact Magisterium uses magic as a metaphor to talk about good and evil in a completely different way. This is what makes Magisterium different to your typical book about magic. Some of the main differences from HP in ‘The Iron Trial’ which I found to be particularly pleasing were the lack of wands and spells. The students seemed to be able to forge the magic in their brains and through concentrating on what they wanted to happen, make it happen! I found this interesting as it made it a lot easier to surprise your enemy if they didn’t know what you were sending at them. I also loved the use of the elements “Fire wants to burn, Water wants to flow, Air wants to rise, Earth wants to Bind, Chaos wants to devour.” and the idea that all the magic in the world comes from these five elements, it made it seem a lot more thrilling than that magic only comes from wands and spells. Callum learns fast the capability of his powers when his faced with the truth about himself. He suddenly realises just how dangerous magic is, and he finds out something about himself he wishes he could never know. But it isn’t easy un-knowing something so impossible to forget. Especially something that makes you so great yet so ruthless. But with the ending of the first book cultivating loathing towards Callum for his malicious decision, how will the books continue? Internecine conflict looms but who could care when Cassandra and Holly have hinted that Aaron and Tamara (Call’s Best friends) will find out what Call has done. They say the book will harbour their feelings towards his decision and will explore how they will move on in their copper year at Magisterium knowing what they know. Will there friendship survive? Only the next book can tell, but the one question that still poses is: Do you trust a magician?